You cannot visit Turkey without coming across a very special dessert called Noah's ark pudding, better known as 'aşure' (aah-shoor-EY'). Noah's ark pudding is a cornucopia of healthy ingredients like dried fruits, legumes and whole grain wheat that are sweetened with sugar and fruit juices and cooked all together in one pot. This pudding traditionally contains apricots, raisins, currants, figs, pine nuts, walnuts, hazelnuts, chickpeas and navy beans to name just a few ingredients. Some cooks even add chestnuts, lima beans, bulgur wheat and slivers of fresh coconut. Almost anything goes. Noah's ark pudding, like many Turkish dishes, has its own story behind it. Turkish legend has it that the first version of 'aşure' was made by Noah himself. After weeks on the ark, the waters began to recede. As food stocks dwindled, Noah decided to throw bits of everything he had left on the ark into one pot. What he got was a delicious pudding that kept he and his passengers well-fed until the ark finally rested on Mount Ararat in eastern Turkey. Some say 'aşure' is the oldest dessert in the world. In modern Turkish culture, Noah's ark pudding is a symbol of diversity, friendship, and unity. When a cook prepares 'aşure,' they make a lot, as it's customary to distribute bowls of pudding to as many friends and neighbors as possible. 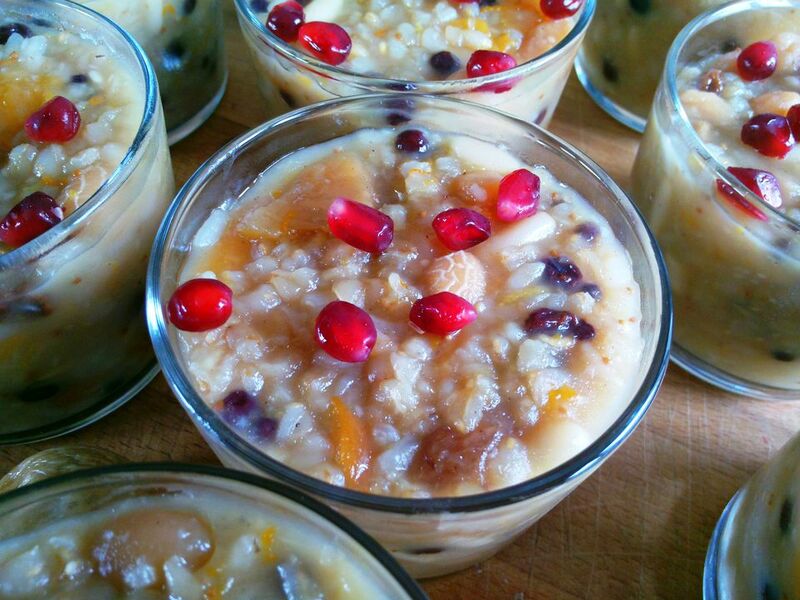 'Aşure,' the Turkish name for Noah's pudding, is associated with Ashura. Ashura is common throughout the Middle East and spans many cultures, traditions, and religions. Ashura was originally a Jewish celebration marking the rescue of Moses from the Pharaoh during which Hebrews fasted. Sunni Muslims also connect this period during the year with the deliverance of Moses. For Shia Muslims, the day of Ashura is celebrated a few days before Ramadan, during "Muharram," the 10th month, to commemorate the martyrdom of al-Husayn, the son of Ali and Fatima and the grandson of the Prophet Mohammed. Ashura reminds Muslims of the sacrifices the Prophet's family made for mankind. The Ashura period is marked by the donation and sharing of food and sweets as an act of communion with God and reunition with humanity. I even heard that a version of Ashura is celebrated as far away as Haiti! There is no set recipe for making Noah's ark pudding. There are hundreds, if not thousands of variations. You can use the basic recipe below as a guide. You can adapt the ingredients and according to your taste or what you have on hand. Classic versions of 'aşure' use rose water to flavor the pudding. I like to add the zest of an orange and a lemon in place of the rose water for a citrusy flavor. Many cooks prefer the pudding plain with no added flavoring. Whichever way you choose to prepare it, be ready to share your Noah's ark pudding with your neighbors, too. This recipe will make enough to fill a large pot. The night before put the wheat or barley in a large pot and cover it with plenty of water. Bring it to a boil, cover and reduce the heat. Allow it to boil gently for about ten minutes. Turn off the heat and leave the grain to cool and soak overnight. The next morning, the grain should have absorbed most, if not all the liquid. Add the chickpeas, beans, rice, dried fruits, sugar and optional rose water or orange and lemon zest. Add more water to just cover the ingredients if needed. Bring the mixture to a boil. Stir the mixture gently with a wooden spoon as it cooks until it thickens. Remove it from the heat and fill dessert bowls or a large serving bowl with the pudding. Once it cools down and sets, cover and refrigerate it for several hours. Before serving, garnish the pudding with fresh pomegranate seeds, pine nuts, finely chopped dried fruits and groundnuts.